Be the first to hear about their new releases and deals. Download the Booksprout app and search for Tracy Tappan today! 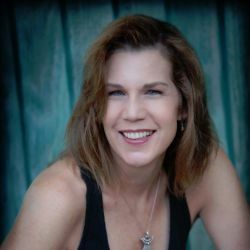 Tracy Tappan is the best-selling author of gritty romance, her novels spanning across multiple genres. Her debut novel, THE BLOODLINE WAR, won the bronze medal for romance from the Independent Publishers Book Award (IPPY), one of the largest national book contests. The second book in her Community Series, THE PUREST OF THE BREED, was a USA Book News Award finalist, and the fourth book, MOON-RIDERS, a Readers' Favorite Gold Medal winner. The third book in her Wings of Gold Series, MAN DOWN, won the Readers' Favorite Bronze Medal for Romance, was a 2017 Kindle Book Awards Semi-finalist, and won the HOLT Medallion for outstanding literary fiction in a novel with Strong Romantic Elements. Tracy holds a master's degree in Marriage, Family, Child Counseling (MFCC), loves to play tennis, enjoys a great glass of wine, and talks to her two Labradors like they are humans (admittedly, the wine drinking and the dog talking probably go together). A native of San Diego, Tracy is married to a former Navy helicopter pilot, who retired after thirty years of service and joined the diplomatic corps. He and Tracy currently live in Rome, Italy.